It's the time of year when advent calendars and kooky Christmas trends start flying off the shelves, and this year is shaping up to be no different. If it's not blue gin that turns pink, wine bottle Christmas trees, or a whisky cask tree creation, it's liquor ornaments. 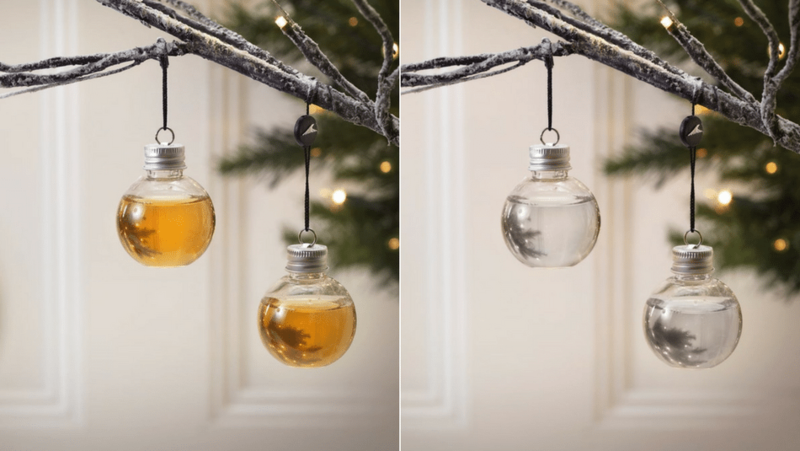 From the Lakes Distillery in England comes three different types of liquor ornaments, and you're going to want each one. The distillery takes pride in the alcohol they fill the ornaments with, so don't expect to find bottom-shelf alcohol inside. Maybe you don't keep all three kinds to yourself, though. These would make a fantastic hostess or host gift for those holiday parties that'll start lining up at the end of November. The Lakes Distillery does indeed deliver outside of the UK, though to learn more about your delivery options, you can check out the website. This set of six whisky ornaments are filled with ONE British Isles blended whisky. On the nose, you can detect aromas of light pine, treacle, fresh fruits, and gentle peat-smoke. The pine matches your Christmas tree scent already, and how unique. What a fun way to celebrate the six nights before Christmas! Or maybe you and your loved one celebrate the three nights before, so you can each have a delicious sip! With the exchange rate, these currently are about $46. For a single whisky bauble, check it out here. The gin ornaments are a mix of three different varieties, with over 10 chosen botanicals, including Cumbrian Juniper, which is one of the oldest plants in England. There are three types of gin in this kit: The Lakes Gin, Lakes Sloe Gin Liqueurs, and Lakes Damson Gin Liqueurs. The Lakes Gin has a palate of honey-roasted nuts, spice, and dried fruits, while the Lakes Sloe Gin has a palate of raspberry jam with cinnamon and orange citrus. Finally, the Lakes Damson Gin is full of fresh cherries, ripe plums, and juniper berries. Like the whiskey baubles, this set is also about $46 with the current exchange rate. For the single gin bauble, find it here. A set of six, these vodka ornaments are perfect for the person who swears by the health benefits of it. Like the gin set, these baubles also feature three different kinds of vodka. The first kind, the Lakes Vodka, has smooth hints of wheat. The second, the Lakes Salted Caramel Vodka, features a salted caramel flavor with a bit of white chocolate and hints of fire-roasted marshmallows. The third, the Lakes Espresso Vodka, will have you tasting notes of freshly roasted coffee beans and dark chocolate, with hints of Madagascan vanilla pods. This set, like the previous two, will run you about $46 with the current exchange rate. You can also purchase a single vodka bauble, found here. This is a unique tradition to start in your own home this year or just an excellent way to stock up on gifts before the season starts.